Bird banding activities began at Rushton Woods Preserve in late fall of 2009 with funds donated by the Delaware Valley Ornithological Club. Since that time, thousands of birds have been documented by our banding team, revealing a vibrant, thriving population of birds that use our open spaces as an important stopover during migration or as a permanent home for their breeding and nesting sites. Located within an 86-acre nature preserve and adjacent to Rushton Farm, the banding station is uniquely sited to measure bird populations' response to agroecological farming practices and habitat restoration and management. Chestnut-sided Warbler banded at Rushton Woods Preserve. Join Us for Bird Banding at Rushton Woods Preserve! Thousands of visitors, school students, college students and grad students visit or conduct research at the Rushton Woods Preserve banding station annually. Its unique site within an 86-acre nature preserve and adjacent to the sustainable farming operation at Rushton Farm offers a remarkable opportunity to measure birds' response to our land protection, habitat restoration and sustainable farming activities. Teaching children and adults the value of conservation, the importance of preserving open space, and the value and use of scientific research skills are the passions that we strive to share with all of the participants that visit our bird banding station. Coordinated by Lisa Kiziuk and led by Doris McGovern, both federally and state licensed bird banders, our staff invite you to visit the station during the season to observe our avian research program. Park in the Rushton Woods Preserve parking lot, located at the southeast corner of Goshen and Delchester Roads, with the entrance on Delchester Road. Walk towards the hedgerows opposite the parking lot and follow the path to the right which eventually turns left and cuts through the hedgerow. Take the left path and follow until you see our banding station. Our banding program runs Tuesday and Thursday of every week during spring migration (April - May) and fall migration (September - November) as weather permits - we don't band if it rains or if temperatures fall below 40 degrees. Although the nets are set 45 minutes before sunrise, visitors wishing to see the most birds should arrive no later than 8 am. Action is often constant until about 11 am, after which the nets are closed. In October, after neo-tropical migrants have left our region, we begin Northern Saw-whet Owl research, capturing migrating Saw-whet Owls in the evenings (see slideshow at left). Advanced reservations are required for this program. If you are interested in participating in bird banding, email Lisa Kiziuk at lkr@wctrust.org. 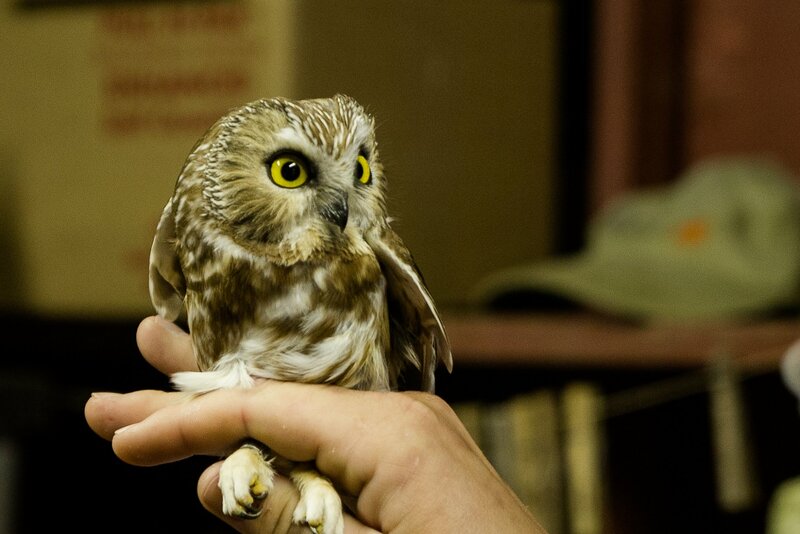 Reservations are required for owl banding. Why Band Birds in Willistown? Bird banding provides valuable information for the study of dispersal, migration, survival rate, reproductive success, and population growth. At Rushton Woods Preserve, we band to document the seasonal and long term population patterns of migratory and resident species. Banding allows us to track individuals, which is important in determining survival, migratory stopover rates, and longevity. Additionally, banding birds allows us to examine bird population response to the various initiatives undertaken by the Trust, many of which impact bird habitat. These initiatives include further protection of land from development; creation of native wildflower meadows and grasslands; sustainable farming; streamside tree planting and riparian restoration; promotion of the use of native plants; promotion of reduced mowing; and reduction of the local deer herd via our deer management program. As more and more habitat in the Willistown area is protected and restored with native plants, bird populations in our area will rise correspondingly. The data we contribute through banding is important for homeowners, land managers and those designing future projects to create habitats that can support healthy, vibrant bird populations. The bird banding station at Rushton Woods Preserve, along with all banding facilities in North America, report banding data to the Bird Banding Laboratory of the United States Geologic Service, which stores this information. This enormous data bank is available worldwide to researchers and scientists studying migration and population dynamics, breeding site fidelity and reproductive success. If you find a dead bird with a band on it, use https://www.pwrc.usgs.gov/BBL/bblretrv/ or call the Bird Banding Lab at 1-800-327-2263 with the band number and information about when and where the bird or band was found. This will provide important information to both those who originally banded the bird and the bird community.